Motherwell FC is today delighted to confirm the capture of striker Alex Fisher on a two-year contract. The 6ft 3-inch front man was most recently with Inverness Caledonian Thistle, where he finished top goal scorer last term. The 26-year old has certainly clocked up the air miles in his ten year career thus far. After coming through the ranks and eventually playing for Oxford United, the Londoner moved to Spain and had a prolific season with lower-league side Jerez Industrial Club de Fútbol. He was quickly on the move again though, and spent the next two years in Belgium, playing for KVK Tienen, KRC Mechelen and, latterly, with K.S.K. Heist. It was whilst in Antwerp his form caught the eye of Italian Lega Pro side A.C. Monza Brianza. He spent a year in northern Italy before returning home to the United Kingdom for spells with both Mansfield Town and Torquay United. In January 2016, then Caley boss John Hughes took him to the Scottish Highlands, although an early injury ruled him out of the second half of the 2015/16 campaign. Fisher finished the current season on fire and ‘Well boss Stephen Robinson had to battle off stiff competition from both the SPFL Premiership and the English League One to secure his signature. ‘Well boss Stephen Robinson added: “I’m delighted to welcome Alex to the club and he will add a bit of firepower to the side. The Motherwell squad will head to Ireland for a weeklong training camp as preparations get underway for the new 2017-18 campaign. Stephen Robinson will take a new-look squad across the Irish Sea to the exclusive Carton House resort, located 20km outside Dublin, for a week of intensive training at the end of this month. Carton House has a unrivalled reputation and has hosted some of the world’s biggest clubs including Real Madrid, Chelsea and even the Brazilian National team. ‘Well boss Stephen Robinson, who is familiar with resort having used it as a base whilst Northern Irish assistant before Euro 2016, said: “Preparation and organisation is huge for me and after reviewing everything about last season, it’s [going away for a pre-season camp] something I feel we probably missed. “I think the time together, working hard, bonding and getting to know each other is extremely important, particularly if you’re recruiting a lot of new players. “I’ve had first hand experience of Carton House and I can honestly say I have never worked in a better football facility anywhere in the world. You only need to look at the teams who will follow us in the weeks after we leave; it’s who’s who of EPL clubs. “The whole resort is first class and, just as important to me, it’s conducive to a concentrated, hard-working environment. The club will announce the first of its pre-season fixtures following the Betfred Cup draw on Friday night. Motherwell FC have been listed as a top seeded side in the South Section ahead of the Betfred Cup draw on Friday afternoon. The Steelmen are joined by Partick Thistle, Kilmarnock and Hamilton Academical as the South Section top-seeded outfits. Second seeded clubs include Greenock Morton, Queen of the South, St Mirren and Dumbarton. Last season’s Betfred Cup opponents Annan Athletic and Stranraer are among the unseeded sides which will be drawn live on BT Sport 2 on Friday. The draw will be conducted live on BT Sport 2 at 6.30pm this Friday (2 June), as well as being streamed live and free-to-view on BT Sport’s Facebook and Twitter feeds. Today is the last opportunity to take advantage of the superb ‘Early Bird’ offers available for 2017/18 season tickets. And ‘Well fans are reminded to snap up their 2017/18 season ticket to not only secure their seat but to also be in with a chance of winning some great prizes. As an added incentive the club have put up some money can’t buy prizes to ensure those that buy early guarantee maximum value when buying their season ticket before May 31st. Motherwell FC is today delighted to announce a three-year pouring deal with Scotland’s leading brewer Tennent’s. Tennent’s continues to grow its distribution at stadia across the country and the deal sees Fir Park join the likes of Hampden, BT Murrayfield, Ibrox Stadium, McDiarmid Park and Celtic Park to work with Tennent’s as a wholesale and supply partner. A range of Tennent’s brands including Tennent’s Lager, Caledonia Best, Magners Cider, Magners Dark Fruit and Heverlee will be available at the stadium, taking over from previous supplier, Heineken. The range will be available at the stadium’s four bars; The Cooper Bar, the Millennium Suite, The Joe Wark Lounge and the Centenary Suite, all of which are available for matchday hospitality and private events. Tennent’s will commence supply at Fir Park from July, in a deal that runs until 2020. The bars will be supported by Tennent’s through a range of POS and visibility designed to promote the brands and drive sales through the tills. Suzanne Reid, Head of Commercial and Marketing at Motherwell FC, said; “We’re really excited to be working with Tennent’s to offer our fans, staff and customers such a vast range of recognised and desirable brands. Bar sales at the stadium are a real contributor to the club’s revenue and part of our growing trading platform. Alan Hay, Tennent’s Sales Director, said: “We are delighted to be working with Motherwell FC as the exclusive beer and cider partner at Fir Park. Tennent’s has a long-standing history of supporting Scottish sport; it’s great to have our range of products on the bar. The Ticket office is open late tonight (Tuesday) and Wednesday for fans wishing to buy their Season Ticket before the Early Bird deadline. The chance to renew at the reduced rate ends on Wednesday, so we are open until 7pm for the first three days of this week to allow everyone the chance to get their ticket on time. As well as getting your ticket at a lower price, we have a number added incentives and money can’t buy prizes for those who pick up their ticket before May 31st. 5 season ticket holders per home game will be chosen at random and invited with 3 friends to watch a game in the South Stand “Fan Box” during the 2017/18 season. A meal out with Tam Cowan and a player as part of Tam’s food review in association with the Scottish Sun. 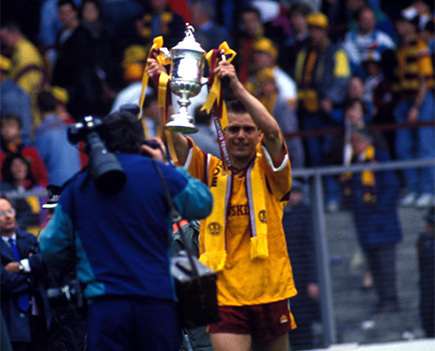 Tough tackling Dutchman Luc Nijholt was a hugely popular figure amongst the Fir Park faithful in a spell at Motherwell that saw him lift the Scottish Cup in 1991. Signed by Tommy McLean in the summer of 1990, Nijholt had been recruited from Old Boys Basel for a reported £100,000. Prior to his season in Switzerland he had previously played all his football in his native Holland largely with Harlem, but latterly at AZ Alkmaar and Utrecht. Luc made his ‘Well debut in a 4-3 League Cup win over Morton on 21 August 1990 and made his league bow in the memorable 2-0 victory over Celtic four days later. He was initially deployed in central defence alongside Craig Paterson and Chris McCart but over time he would prove himself capable all across the back line. The defender suffered a broken leg just four months into his ‘Well career but returned to full fitness as Motherwell’s Cup run began to gather momentum. 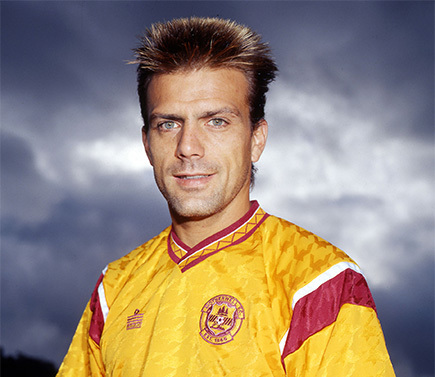 After missing out on the opening two ties, Nijholt featured in every round from the Quarter Final against Morton onwards and capped his first season in Lanarkshire in style, by helping Motherwell to their first Scottish Cup win since 1952. Luc’s second season in claret and amber saw him reveal a previously unseen facet of his game. Taking advantage of his much admired calmness under pressure, he inherited penalty taking duties and netted three spot kicks in the opening month of the season, including a late winner in the first ever Premier League derby between Motherwell and Airdrie. Over the course of the season he slotted home no fewer than six penalties. Having been a member of the Cup winning side and involved in the first ever Motherwell side to play a match in Europe, Nijholt’s third season at Fir Park had no such highlights, yet it would still be a rewarding campaign. With Tommy McLean’s side in danger of being detached at the foot of the table, a second half of the season turnaround saw Motherwell escape the drop on the penultimate weekend of the season after a tense encounter that saw Dougie Arnott bag a late winner against Falkirk to send both the Bairns and Airdrie down. A measure of the impact Nijholt had made in Scottish football was evidenced when Luc was offered the opportunity to play in the English top flight with Swindon Town in the summer of 1993. Having given the club three years of terrific service Motherwell didn’t stand in the Dutchman’s way and saw the £175,000 fee for a player edging towards veteran status as fair compensation. After two seasons with the Robins, Luc returned to the Netherlands to join Volendam where he concluded his playing career. Moving into coaching he was at one time assistant to Louis Van Gaal at AZ Alkmaar and given his noted fondness for the Steelmen, he has been linked with the manager’s job at Motherwell more than once. With just 4 days to go until the end of the early bird offer supporters are reminded to snap up their 2017/18 season ticket to not only secure their seat but to also be in with a chance of winning some great prizes. With a busy pre-season ahead for Motherwell Football Club, MFC TV caught up with one of the busiest departments in the club – the ground staff – as Paul Matthew discusses the work taking place on the Fir Park turf. With a limited time before the 2017/18 campaign gets back up and running, it’s a hectic spell for the ground staff. For more exclusive content, subscribe to MFC TV’s official YouTube channel. Motherwell Football Club Community Trust is holding a one-day ‘World Cup Camp’ on Thursday 8th June for children aged 5-12. The fun tournament will involve small-sided games, skills challenges and fun activities for any kids whose schools are closed for the General Election. All sessions are delivered by the Community Trust’s fully-qualified coaches, who are all members of the PVG scheme. Motherwell FC Community Trust General Manager Dawn Middleton said: “We have planned a busy day for participants, with small-sided games, skills challenges and fun activities. The cost is £10 for the full day or £5 for a half day, and children are asked to bring their own packed lunch. Registration is at 8:45am with pick up at 3pm. Visit the Trust’s website here to book and get in touch.